Bill:	Well, Matthew, I want to welcome you to the show today. Matthew:	Thank you for having me. Bill:	Well, I am really pumped up to have this conversation with you more than normal, and we'll the into that in a moment. I know that you are sleep deprived, and in the middle of a bunch of entrepreneurial firefighting, so I appreciate you for jumping on and talking to my audience about some of the interesting things that you're doing. Well, that's my pleasure. I think this is an exciting time, and I think your podcast covers some great, diverse topics. Hopefully, I can add some value. [00:01:00]	Yes, and we're going to get to the point about what’s your passion in your business focused on eliminating poaching for the rhinoceros and ivory trade, and we’ll get into that, but I’d love to talk to you about and ask you questions about how did you get started? Have you always been an entrepreneur? Is this something that’s just baked into your DNA, or did you discover this as you at some point in your life that you were an entrepreneur? [00:01:30]	Yeah. Well, I guess entrepreneurship, I guess, came to me out of frustration. I guess I get frustrated easily, and then I just want to kind of solve things and move ahead, and sometimes in larger corporations, you’re not always allowed and do that. I think that sort of pushed me out of those kind of environments and into entrepreneurship, and I started, I guess, quite young, in my early 20s, but it was a good time to be an entrepreneur because that was during the Internet boom, the dot-com boom. They say the most dangerous thing about gambling is you win the first time, and I did win the first time out because it was a good environment, and we had a good idea and a good team. So, ever since then I’ve just kept playing the game over and over again. What were you referring to when you built PrivacyBank? Was that your first win? Matthew:	Yeah. That’s correct. Yes. We were focused sort of on this idea of an infomediary which at the time was going to be a data broker between you and corporations, and you basically would submit your data, and it would be governed by us. Almost kind of like a union for your data, and we’d get the most value for your data on your behalf. How did you come up with that idea? How did the genesis of that company idea come to you? Matthew:	It really just started with form filling because at that time there was really no … a clear e-commerce winner like Amazon is now. I think the thesis was there was going to be a lot more small, independent shops online, and that you’d have to continually reenter your information over and over again. So, having a sort of a centralized wallet would be of great value to the consumer, and then since it was centralized, we’d also have some negotiating power vis-à-vis these smaller e-commerce sites. So, it was essentially a way for someone to enter their data, and then that would be shared out across these other … Were you envisioning being like the broker of record, the entity of record? [00:03:30]	Yeah. It started really just being a utility. You would go to a site, in your information would be stored in our server, and then you’d drag your information over, and it would automatically populate the form. It was very early Autofill, but it was a server-based Autofill. Then you could share information, and share like gift ideas and stuff like that on the platform. It was almost like a … in some ways it was sort of like a protozoan social network, except we didn’t really understand what a network was, and we didn’t add pictures, and we didn’t add status updates. We had information sharing, but it was at a very utilitarian way of information sharing. Yeah. We started in ’98, and we went from ’98 to 2001, 2. In there. Bill:	Wow. That’s very fascinating. Also, you have a master’s in genetic epidemiology? [00:04:30]	Then you are also an engineer, a master’s in engineering and engineering management, so how did you … like, those are two different disciplines. What was your interest in genetic epidemiology? How did that start about? [00:05:30]	Well, after doing the entrepreneurship thing and having a successful run, I wanted to go back to school, and I was always sort of fascinated by biology. Of course, I’m not a wetland person. I didn’t really have much wetland training as an undergrad. My undergrad was more computer science-based and mathematics-based, and so I thought the best way into biology was through my already acquired skill set which was quantitative. So, genetic epidemiology is sort of the study of correlations between diseases and genes, and so it was sort of a natural way to get in there. Then the engineering management was just a MBA for engineers I think, and I didn’t really want to go into business route per se. I just wanted to understand some things that I didn’t really understand. I was like the CTO of PrivacyBank, and so I wasn’t really exposed to much of the business side, and so I was kind of a novice. I just wanted to learn things about accounting and whatnot, and so that’s why the other degree there. Bill:	Wow. I didn’t realize that that all came after PrivacyBank, so basically PrivacyBank was sold, then you went into becoming more of a student again? [00:06:00]	Yeah. Yeah, I wasn’t sure if entrepreneurship was for me, and so I went back to academia, but then I realized, “No, academia is not for me either.” I’ll go back to entrepreneurship again. Bill:	For your current company, Pembient, how do things layout from a business point of view after you got out of your master’s program with a epidemiology? What were the steps in between that and Pembient? Was there another startup in between that, or did you go right into Pembient? [00:07:00]	No, I helped a friend with a mobile app company that he’d started in Seattle, and that was around audio and text to speech technology. It developed a small audience, but it wasn’t really growing as fast as we had hoped, so around that time … The idea for Pembient actually was almost 20 years old. I actually had written it down a long time ago during the first poaching crisis, this concept. Of course, poaching had kind of gone quiet for a while in early 2000’s, and so when it started to hit the new cycle again in 2000 … it started really in 2008, but a big uptick became apparent 2012, 13, 14 when I was working at this mobile app company. It got me thinking back to the idea again, and it was sort of an itch that kept appearing, and I finally decided I should really scratch it. Yeah. That’s interesting because I remember my mother back in the ‘70s who would read us books back when that was, I guess, something was done more frequently. She would go out to the library and get these really interesting books, and I remember she got this series on poaching, and I remember it stuck in my head as a [inaudible 00:07:46] at five, six, seven, eight, ten years old. It stuck in my head that this was a problem back in the ‘70s and it bothered me, and I think I shared with you when I was in Singularity we were really focused on, “How do you solve some of these big problems in the world using exponential technologies?” So, when did you start to marry the … what was the genesis of it that clicked finally for you to get Pembient off the ground? [00:09:30]	Yeah, and let me back up a second just for listeners so they can kind of get a lens of what we are talking about here. One of the pieces that I think people don’t understand is what we can actually print these days. We can print human tissue. We can print organs. We are printing meat now. So, there are people are looking about how you stop eating and will meat, which is interesting in itself, because is a growing planet how do we print meat? There’s companies that are printing meat, this company’s printing organs, and so the technology’s there even though is not necessarily known. [00:10:30]	I just had an expert come down from Boston to speak to my CIO Innovation Insider Group about additive manufacturing, in what we can print -- what’s real? Like, plastic toys? Are we printing plastic toys, or can we actually print steel, and what’s the state of that? He was the top guy in United States Navy about printing … the Navy wants to know can they print? Can they put a printer in the front of the battlefield and start printing parts for things that are failing? They actually found out they couldn’t do that. There’s too much fluidity in the battlefield for them to be able to do 3D printing at the front of lines. It’s interesting that you actually are saying, “Well, why can’t I do this for impacting the global trade for animal poaching?” Maybe we could start there. What part of coaching are you trying to tackle with your company and then your ideas? 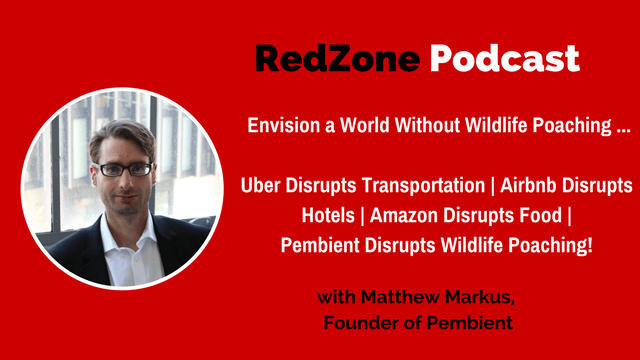 [00:11:30]	Yeah, so our vision for the company was sort of a world without wildlife poaching, and that might be a grandiose vision, and Pembient in its solution it’s probably not applicable to every single case of poaching, but for certain animals, we think it’s very relevant. So, the rhinoceroses probably is probably the test case. The rhino’s horn is basically a solid mass of protein, and it’s the only animal’s horn that’s solid. All other animal horns are sort of hollow keratin sheets, and so that makes the rhino very unique, and it turns out that the rhino’s horn then has … because it is solid it’s a very good carving medium for making large, solid objects. You can’t really make those objects are of any other animal horn. I’d say it would be sort of like making a statute out of pebbles. You know, the carpenter wants to carve this solid object. They need a lot of this material. [00:12:30]	The only animal that provides a lot of this material in bulk is the rhino. So, that’s sort of the problem. Of course, there’s not that many rhino’s in the world anymore. There’s about 20 to 30,000, and so the prices for this solid keratin, which is the protein, this solid mass, are very high and have gone up in recent years. They’ve gone up to such an extent that it started to look like that you could use technology to manufacture or grow this substance in a laboratory actually a lot cheaper than the final end price it was fetching in the markets. Our goal then was basically to use modern technology to drive the cost down, and to sell it at a level that would kind of undercut the poachers and leave them out of the game. That they couldn’t really earn a living because it’s not really a great living actually. [00:13:00]	It’s a very risky undertaking. You have to go into these national parks to hunt these animals in the dead of night with people looking for you and wild animals out there, so it’s a kind of opportunity and people only do it because pays so well. So, trying to adjust that cost curve is kind of the idea or the genesis behind Pembient’s mission to halt wildlife poaching. Yeah, and so when you went … I think that’s a wonderful vision, and it’s definitely world changing, and I think it gets people excited. How do you reconcile the fact that like South Africa burns there … There’s certainly a societal impact in infrastructure people, and there’s a kind of black market of trade that’s going on. Then I know in parts of Africa they actually will find these horns and burn them, and so they have the supply already, but they’re not turning it into the market. Then I know even National Wildlife Foundation and National Geographic here in DC, they don’t even support this approach, so how do you reconcile that? [00:15:30]	don’t really like to pick a side in the battle per se because it’s a little bit outside of what we're specifically focusing on. There’s other countries to like Botswana, which has sort of a hybrid approach. So, everybody’s got these different philosophies, but, yes, I guess from the standpoint of burning stockpiles, we don’t think that’s a great idea. In fact, I think one of the most disappointing things about conservation, when you start to get into it, is just realizing how little of it is based on evidence. There is starting to be a small push for a sort of evidence-based conservation, but a lot of conservation is just basically strongly held beliefs re-told with force. Yeah. That makes sense, and it’s also if you spend all your time and all the noise around the issue you will get the systems up that you need to actually create in mass. I think that’s one of the pieces about printing is the volumes. Can you walk us through how you go from taking a big vision like this? What steps did you take? You clearly had some of the science background, so you didn’t need probably to find too many scientists that could parallel you, but maybe you did, and then how did you build the capabilities within your model so that you could get to a point where that you could mass-produce this? Can you explain that for us? [00:17:30]	Yeah. Obviously, we are still not anywhere close to mass production, but we basically … there’s kind of two approaches. This would fall under the umbrella of cellular agriculture, what we are doing, and that’s the application about technology to produce animal products. Within cellular agriculture, there’s sort of a cellular approach and a acellular approach. What we started with was the acellular approach, and that basically is saying like, “Can you create the constituents of the product, and then reformulate it or reconstitute it in some manner?” It’s very biochemical, and so that sort of where we started. The idea was basically to get the proteins created, and in this case, the acellular approach would be basically to use a microorganism like yeast. It’s acellular in the fact that it’s not the animal cell. It’s a foreign cell that you then transfect with the DNA that produces that protein, and then produces the protein of interest, and then you purify it. [00:19:00]	Then you basically take that to a next step, which would be to reconstitute or reformulate a solid. We took that approach because we wanted to get to some sort of solid prototype quickly, and that seemed like the quickest approach or the fastest way to get to sort of prototypes, and so that’s what we did. We were able to produce small, solid chunks of horn. I sometimes call them Frankenhorns because we had different DNA sequences from different species and things like that, and we had different horns from one species, and then a DNA database from another species. We just put together whatever we could to get to a prototype. Subsequently, and initially, the business model was focused more on this alleged medicinal use of rhino horn, which was published in the press and by NGOs for a lot of the poaching crisis from 2012 up until 2014 or 2015. It turns out that there’s subsequently been a lot of research that kind of shows that that has probably been overstated and, again, that really the carving uses a rhino horn are what’s really driving the poaching crisis. [00:19:30]	The medicinal uses of rhino horn are already sort of fake. I mean, if you grind up any sort of horn, whether it’s a buffalo horn, a cow horn, an ox horn, it pretty much looks the same as rhino horn. So, there’s actually already a lot of fakes in the medicinal use case marketplace I guess, and it’s really the solid chunks of horn that are so hard to fake. Even the small prototypes we made, they did not have all the material science qualities that you would want for a carving. They might crack or shear incorrectly and things of that nature. We are now going back and trying to redo everything through a cellular approach, which would be basically more like growing the object instead of printing it, and that sort of the learnings on the science it we’ve had over the last two years. That's fascinating. That’s really fascinating. You actually answered one of my questions and raised another one. I was thinking about the source of this, and whereas the business model can be built on. So, you originally explored the medicinal part, and found out that potentially that was a red herring and more the … it was carving, the carving utility, but the approach you’re using was more brittle I guess? Brittle, and now you’re thinking about kind of pivoting in the approach a little bit, and so is the ultimate goal to be able to kind of kick out blocks or material that can be carved by a craftsman? [00:22:00]	Yes. Yeah, I think the key value that we're trying to do here is basically unlock the natural … the horn has natural limitations on its size. We want to use biotechnology to unlock those limitations. You can imagine like giant tiles, like walls, of solid horn. Horn used to be … even in the West horn was always used for carving to make things whether it was boxes, combs, but you could only make very limited things with horn because of its geometry. Eventually, horn basically went to the wayside because we got petroleum-based moldable plastics. That kind of filled in for horn, but horn was sort of the original bioplastic, and it was actually a very sustainable bioplastic. It just had a lot of limitations, and so what we’d like to do is actually bring horn back, kind of go back to the future, but this time horn has no limitations. We can make arbitrarily sized solid masses that craftsman can fashion into anything, and so hopefully … and 99% of the plastics in your house will actually be natural, biodegradable horn in the future instead of petroleum-based. [00:22:30]	That’s fantastic. Now, from a grid and resilience point of view, so there’s a lot of … you’re in a world where more people are going to say no than yes, so how do you deal with just the amount of tenacity that’s needed to keep experimenting, experimenting, experimenting on this business model and on this solution that you want to bring into the market, into the world? How do you find the resolve and the grit to keep at it, keep at it, and keep at it? [00:23:30]	Memphis Meats is growing meat. Yeah, it was an indie bio company, so they're basically making clean meat. Similarly, [Hampton 00:23:00] Creek also announced that they were going to clean meat maybe a few weeks ago. Then you have Modern Meadow which does bio-fabricated leather. Anyway, if you look at it, they're basically taking every part of the cow and trying to reconstitute it in a laboratory setting, and then mass-produce it without the need for the animal. Well, if you don’t need to animal for the meat and you don’t need the animal for the hide that’s great, but there’s a whole industry out there which is the horn industry, and the horn industry uses cow horn. If you don’t have a replacement for horn, and you’re replacing every other part of the animal, guess what? This industry is not going to die. This industry … there’s tons of people who have their livelihoods tied to this industry. They will just source more horn from the wild. [00:24:00]	I mean, you’re actually sort of saying a policy ... a big problem, and unless you have all the components of the animal replicated then you’re going to actually create a bad … you may think you’re doing something good. You maybe think, “Oh, we are removing domesticated animals from production,” but if you don’t account for all the uses of the animal and all the parts of the animal that are used, you will actually end up exacerbating and actually harming animals in the wild. [00:24:30]	Yeah, it’s the better that humans get with this technology, we are almost being put into position of impacting the natural ecosystems just of the world we live in in very profound ways that used to just be done pretty much naturally over time. A species, before we had the ability to influence this way, it was these natural impacts in order of complexity ripple down effects were handled by the larger bio organism, and now we have the ability to influence it in short amounts of years. It’s very, very, very powerful. [00:25:00]	Yeah. I think we just need to be cognizant of the fact that when we do animal replacement, there’s a lot of parts of the animal that are used for lots of different reasons. To just go in the blinders on and do a product replacement for a particular part of an animal without thinking of the system as a whole, I think that’s dangerous. [00:26:00]	So, you went down the route of ... How does someone that's going down this path just from a macro level raise funding for this and find access to experts? Because that’s an area that a lot of businesses who struggle with individuals … we have the ability as individuals now to tap into experts to pull this type of stuff off. Like, I don’t have to be a machine-learning expert to pull off a really great machine-learning … solve really great machine-learning company problem. I just have to know where to go, and so how do you access funding? How do you access people and resources? What is the kind of approach that you’ve used and some of the tools and platforms that you think are best for people? [00:27:00]	Well, we were fortunate to be accepted into IndieBio, which is the independent biology accelerator there in San Francisco, and they provided us with some initial capital and a lot of mentoring. So, that was a great and fortunate first step. We also rely heavily on, again, outsourcing and CRO’s and things of that nature. Also, I think we focused a lot on de-risking the business. There’s no use in building a huge, complex technology platform if you’re going to build the wrong product. Again, we started out with this powder because of this medicinal use case, and then we’ve tried to do this rescue operation and the power to create solids, which weren’t necessarily a great product market fit because the solids didn’t have the same properties as the solids … like real horn. So, I think it’s just these two things go in lockstep. [00:28:00]	Also, de-risking because you need to be careful. You don’t want to jump in and think you understand a market without actually understanding the market, and so I spent a fair bit of time also traveling and meeting a lot of these horn carvers in Southeast Asia. In fact, that’s how we realized the limitations of horn. I was in one of these villages, and I had a guide who actually knew some of these families, and they got all excited, so the guys hopped on a motorbike and drove away, and they came back. They came back with the tile that was all sort of like blobby. It felt sort of like plastic, and basically, they had tried to … within the village their selves tried to develop some sort of polymerization technique to create a larger horned tile than what they could from normal horn. [00:28:30]	That was sort of like a big aha moment going out and talking to the customers, and so I think you always need to do that also. That’s where most of your resources I think should be spent at the beginning of a company is getting out there, talking to people who use the product, and understanding the current, existing supply chains. It’s very difficult, of course, when you’re working in sort of a gray or black market, but it’s also very rewarding. [00:29:00]	Yeah, so you’re really using that design principle of really understanding the buyer and understanding at a boots on the ground level what’s actually happening, which is … Yeah, from San Francisco out into the field, that’s a big jump. Are you actually envisioning eventually having the technology in the field for other people actually to do it? Do you think that’s where it’s going to have its biggest impact or what are your thoughts there? [00:30:00]	I think that all that really needs to be done is … I’m not sure about … We’ve gone back and forth about manufacturing in different countries whether it be East Asia or South Africa even. There’s definitely some great things to do there. One vision would be basically the manufacturer nearer the park system like Kruger in South Africa because, obviously, it’s a relatively inexpensive environment to work in and to scale potentially. At the same time, you could maybe have small cottage industries evolve around the art of carving near the park system itself so that people there have employment and jobs because that also is one of the reasons why there’s a lot of coaching is because it’s sort of self … some people call it almost like kind of a perverse economic development. There’s nothing to do, and so they come up with their own businesses, but these businesses are environmentally destructive. [00:30:30]	So, having maybe a carving industry, or having a carving industry sort of move from Southeast Asia where the cost of labor is going to be very high, have it move our transplant to South Africa, could be of some benefit to the people there. We’ve kicked around some of these ideas, but right now that’s very blue sky. I think what we are really focused on is, again, producing basically 1 kg cylinders of solid horn, and selling them directly to the carving industry. Could sell it to carvers, industrial designers, artists, artisans, and basically selling it at a very attractive price point. Much more attractive than you could get it sourced from this illegal supply chain. That’s a very focused goal. Again, I’m sure that helps align a lot of resources just by that one single objective? Matthew:	Yes. Yes, it took a long time to come up with that objective but, yes, now it’s a good guide star. Bill:	Are you doing any interesting fundraising options to exploit right now? I know you, and I talked a little bit about ICO’s earlier. Are you exploring that option, or just using more traditional private equity sources of funding? Well, again, I think because it is … I don’t believe it’s only a foreign market. I do believe there’s going to be a huge Western market for the product also because, again, once horn becomes usable just like plastics, I think a lot of people will want to use it. We’ve had Western brands inquire about shirt buttons, suitcase handles, all kinds of different things that they want to create out of it, but I think it’s always helpful to try to get customers early and prove revenue early. One way we're trying to do that is through an initial coin offering. Now, I think initial coin offerings are a big, big, diverse topic, and you have utility tokens for software, you have things that I like securities or equity tokens, but what we settled on was what you’d really call maybe like a prepaid forward contract, which is a type of derivative that’s not really regulated. [00:33:00]	It just falls under private contract law really. It basically says, “I’ll give you some money, and then you give me a product at some point in the future.” It’s almost like Kickstarter except it’s a tokenized Kickstarter, so you could kind of you … like, right now Kickstarter’s binary, right? You either get a … let’s say I want a cooler. I either get the cooler the summer, or I don’t get it, but in real life, you might be like, “This cooler’s not being delivered.” You might go out and buy another cooler. Then you might be like, “Well, I don’t really need this cooler I ordered on Kickstarter, so maybe I can resell the token that represents this cooler at a discount to somebody else who could use it, and I can recoup some of my investment.” What we're really doing is sort of a tokenized Kickstarter. [00:34:00]	Yeah. I love this concept. For the people that are listening, ICO’s are a derivative invention really building upon blockchain, and very, very interesting to see where ICO’s are going to go with the SEC and such, but definitely some very significant players are jumping into ICO’s now and raising vast amounts of money very, very fast. It’s going to be interesting to see where it goes, but I love what you’re doing there with fundraising relate to this because it could be a very important tool. Even people are floating part of the shares. They’re maybe have, metaphorically, 100 shares in the company, but they may be only carve out 10 or 20% to be this ICO offering, so it’s an interesting option for people that to consider. So, you’re using multiple different exponential technologies within your bigger thesis of your company? [00:34:30]	Yeah. I think we have a certain vision of what the future should be, and I guess we just have decided to pursue it. Yeah, the bio-fabricated horn should be a commodity. That commodity should be tradable. These are just things that need to happen, and so we're slowly working to make them real. [00:35:00]	Yeah, and also you're finding other potential I imagine. You mentioned buttons for example, but I’m sure that as you through this process that there’s a part of your antenna that’s sitting there going, “Wow, I might have just discovered another potential use case for the business. Another product line that might just be an ancillary product offering that get launched in the future,” just because of all the research and problems that you’re trying to solve with the wildlife trade industry? Bill:	Well, you talking about harshness. It’s been zero innovation. I mean, we’re not in the ‘70s, and we have 30,000 left ... zero. I mean, this is neat what you doing. This is great. [00:36:30]	I think there’s been many people doing some really interesting stuff with like paying for … like, the red carbon credits. Like, paying people to manage forest area so that they don’t cut down trees. There’s been some innovation, but I think by and large there’s sort of been a monoculture in place, and if people step out of line or if people do things that the standard-bearers don’t want done there ostracized. And, no, we don’t really care. I mean, I’m never going to be working in conservation, or at least not in the official channels of conservation, so we do kick up kind of a dust cloud wherever we go. [00:37:00]	Well, so did Uber. Their dust cloud was the taxi drivers, and Airbnb’s dust cloud is going to be in the hotel industry, but you’re right, it’s a big industry in the black market, and people are going to be upset. Unfortunately,, Hyatt probably won’t come out and hire Tony Soprano to come out and throw you in the back of his car and dump you in the river, but with the black market they're some characters that are probably going to be upset. [00:37:30]	What’s interesting is Belgium … To talk about innovation, I know Belgium was really concerned about the drug trade. I don’t know which country in the continent of South Africa was, but they established a high-speed link between Belgium and this part of South Africa that was … they were concerned about the drug traffic, and they knew if they could identify the drug … they knew part of the channel for the drug traffic was actually on the ivory trade coming to that particular country, so they outfitted drones with a machine-learning algorithm that actually watch the herd and could kind of recognize when zebras were agitated because of a lion, or whether they were agitated because of a poacher. [00:38:00]	There is a certain pattern that was able to be picked up, and then they radio collared to the shoes of the park rangers to identify when they noticed poachers were in the neighborhood, and so they tried to marry drones, machine-learning algorithms, and sensors to the poachers. So, you’re right, there is innovation going on, but nothing quite like saturating the market and driving the prices down. That’s really, really outstanding. Well, I really appreciate you for coming on the program, Matthew. How can people learn more about your organization and yourself? Well, we have a website up, pembient.com. We are on Twitter. We are on Facebook. We try to post regularly, and I think there’s a … We’re probably going to start a blog now too, so hopefully, we’ll have a lot more original content out there. [00:39:00]	Well, this is great. I’m going to put this all in the show-notes page and our blog so people can get access to the different things we talked about. We covered a wide swath of different technologies and ideas, and so we’ll capture that all on our blog and link back to you so that they can find you on one of those channels that’s appropriate. I want to thank you for all the work you’re doing in the world to help make it better, Matthew. I think this is a great, very courageous step, and I appreciate you for all the work you’re doing. Matthew:	Oh, thank you. Thanks for having me on. I appreciate it. Bill:	Okay. Until next time. I’ll talk to you later, Matthew. Bye-bye. This entry was posted in Blog, podcast on January 5, 2018 by Bill Murphy.